The Economic and Financial Crimes Commission (EFCC), on Tuesday, closed its case against a former Chief of Air Staff, Air Chief Marshal Alex Badeh (Rtd), who is facing trial over allegations of money laundering to the tune of N3.9bn. The former Air Staff boss is standing trial alongside Iyalikam Nigeria Limited, before Justice Okon Abang of the Federal High Court, Maitama, Abuja. He is being accused of abusing his position by diverting Nigeria Air Force, NAF, funds for personal enrichment, and acquisition of properties in choice areas in Abuja. He was first arraigned in 2015 on a 10-count charge bordering on criminal breach of trust, abuse of office and money laundering to the tune of N3.9billion. In a statement by the spokesman of the anti-graft agency, Wilson Uwujaren, says, “Upon discovery of fresh evidence, Badeh was re-arraigned by the anti-graft agency on July 4, 2018, on an amended 14-count charge bordering on money laundering, which he pleaded not guilty to. “That you, Air Chief Marshal Alex S. Badeh (Rtd) And Iyalikam Nigeria Limited on or about 24th February 2016 in Abuja within the jurisdiction of this Honourable Court, did retain possession of the sum of $1,000,000.00 (One Million Dollar) only which you kept at No.6 Ogun River Street, Off Danube Street, Maitama, Abuja which funds you reasonably ought to have known formed part of the proceed of your unlawful activity to wit: theft, criminal breach of trust or corruption and you thereby committed an offence contrary to Section 15 (2) (d) of the Money Laundering (Prohibition) Act 2011 as amended in 2012 and punishable under Section 15 (3) of the same Act”. 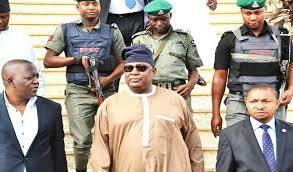 The statement further said that “At the resumed sitting, counsel to the EFCC, Rotimi Jacobs, SAN, told the court that the prosecution would be closing its case, after calling 21 witnesses to prove the charge against the defendant (Badeh). “With the close of the prosecution’s case, the stage is set for the defendant to prove his innocence on the charges preferred against him”. However, Badeh’s counsel, Akin Olujimi, SAN, informed the court of the defence’s intention to make a no-case submission, noting that the prosecution had failed to establish the necessary ingredients as to warrant an explanation from the defendant. Posted by Mr. Cis on October 24, 2018.